Powers/Abilities: Mr. Spindle is a talented and manipulative businessman with contacts in the criminal underworld. History: (Daredevil I#182 (fb) – BTS) – Mr. Spindle was on the board of directors for Glenn Industries. He sought to slowly take control of the company from Heather Glenn through a series of acquisitions. (Daredevil I#182) – Spindle and the others held a meeting with Heather, trying to get her signature on requisite forms, but she wanted her attorney Matt Murdock to look them over first. (Daredevil I#185 (fb) – BTS) – Spindle formed criminal connections with Kingpin and agreed to use Glenn Industries to develop bombs. (Daredevil I#184) – Spindle coached Heather on signing multiple forms, reminding her that she could step down at any time. When she expressed doubts about paperwork related to Atreus Plastics, Spindle made an excuse and just told her to sign. 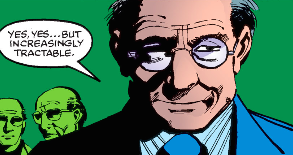 (Daredevil I#185) – Having figured out that the Atreus Plastics connections in the company were related to bomb-making, Heather brought in "Foggy" Nelson as legal counsel and she demanded to know about the bombs but Spindle countered that she should have thought of that before she signed the forms. (Daredevil I#186 (fb) – BTS) – Attorney Matt Murdock began filing injunctions against Glenn Industries, putting them under full investigation. Spindle spent a lot of money hiring Stilt-Man to protect them if it came down to it. (Daredevil I#186) – Heather confronted the board directly and Spindle arrogantly stood his ground, insulting both her intelligence and her father. Daredevil appeared in the window, saying the company was going down, though he vowed Heather would not be harmed. Stilt-Man showed up and said he would be charging double the rate since Daredevil was now involved, flummoxing Spindle. Later, charges were filed against Glenn Industries and Matt Murdock predicted the company would be shut down.